I finally downloaded pictures from my camera, including some taken on a Sunday in late August. This birthday party was a bit of an historic event. First, the birthday boy hit a milestone this year. I'll let him tell you the number if you can't guess. Let's just say one of his gifts was a TV remote control the size of a laptop computer. 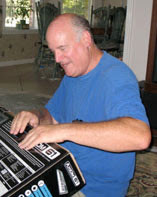 The local Burdines all went together to get this young-at-heart rock'n'roll studio band architect a computer-driven keyboard. I don't fully understand what it is, but he seemed pretty geeked about it. Maybe he was just glad to finally reach the end of a hunt that had him searching the fridge, the workshop, and his toilet for clues. OK now, seriously, this is the face of someone who is really excited at what he is seeing. Don't you agree that you can see a bit of childlike glee? 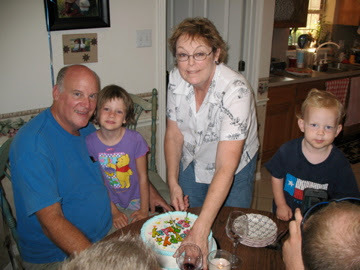 Second, it was the day before his first grandchild started kindergarten. That was a momentous occasion for several of us. He accepted it as a birthday gift that she was here to start school down the street. And third, it marked the first family celebration of the new mix of local Burdines. We didn't have to all come over, since we already live here, but it was still a special occasion. We grilled steaks and had a bunch of side dishes I don't remember; and we finished off with an ice cream cake. Sounds like a totally awesome August birthday party to me!